Every year the closest weekend to the actual fourth of July, the Bay City Fireworks Board of Directors and Sub-board, work together to put on an amazing fireworks display in the City of Bay City. Its a three day festival that people come from all over the state to see. It spans to both sides of the river in Vets Park and in Wenona park. As Administrative Director I do all of the permits and licenses so that the festival can happen. 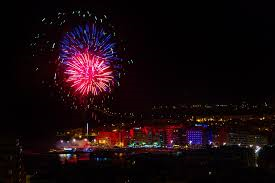 The first license that I do is the City of Bay City use permit that allows the Bay City Fireworks Festival to use both of the parks, Wenona Park and Vets Park, for our festival. Included in the permit is for us to be able to use the wooden and steal fencing that the city stores for different uses. We also every year buy additional wooden fencing that we donate to the City because over time the fence breaks and gets destroyed. We use miles and miles of that fencing all around both parks. The permit also gives The Bay City Fireworks Festival the right to charge for people to get into the parks. We charge $1.00 for Veterans Memorial Park and $5.00 for Wenona Park. The reason that Wenona Park is more money is because we also have Bands that preform at the Friendship shell each night of the festival. A lot of people believe that they shouldn’t have to pay to get into the parks but for that weekend the Bay City Fireworks Festival is renting it and what ever we choose to do or charge is up to us and has nothing to do with the City of Bay City. That’s why we fill out a use permit. Then next license that I do is the US Coast Guard marine event permit. It lets the Coast Guard know that we will be having this festival and shooting off fireworks from a barge in the middle of the Saginaw river. The Coast Guard will have their people on hand for everyone that choose to watch the fireworks from their boats and to keep them away from the barge shooting off the fireworks. The Sheriffs Patrol also will be there to help control traffic in the river. Another license I do is everyone’s favorite, the Liquor license. There is a beer tent by the ball diamonds in Veterans park and you can get a drink there but you can’t take the beer out of that ball diamond area. Wenona park is the entire beer tent and there are two places you can buy the beer from. One where you first come in the park and one in the VIP tent area. You can drink anywhere in Wenona Park. We get a bond from a local insurance company and then I fill out the permit and take it to the Bay City police department to have the lieutenant sign before I send it in to the State for approval. We have to have two separate license for each side of the river. One of the last permits is the Application for Fireworks display. It is so the City of Bay City will permit us to light off firework for those three nights in the park. Besides the permits I also take care of our insurance and making sure we have the right amount with the best price. We also take out rain insurance in case it rains on one of our nights. We could loose a lot of money so we make sure we are covered. My job is just one of the many that it takes to put on the biggest and best fireworks display in the state of Michigan. You will be hearing from the other board members about their jobs and what they have to do to make this happen. Please join us June 29 – 30 and July 1, 2017 for a amazing festival and the best fireworks show around.